Last night we had a drama over peas. What happens is that a very very small portion of whatever vegetables the rest of us are eating are placed nonchalantly by me on to Freddie's plate. I have taken on board the whole "take the heat out of eating" line and don't refer to the offending articles of greenness on his plate. I don't draw attention towards them. He eats around them like a small bird pecking out bits of breadcrumbs. And at the end of the meal, of course, the peas are there waiting... He looks up at me and the bargaining begins. "If I eat two peas is that enough?" I am used to him starting the bids low. "Now Fred there are only seven peas on your plate, can't you just eat them? ". He then starts to turn pale. He slumps down into his chair and fiddles with his cutlery, accidentally on purpose knocking them onto the floor to create a diversion. I remain very calm and come in with my next bid. Five peas. Just eat five small green peas you can have pudding. Now I don't care if this breaks every child-rearing rule if it works. Trouble is it doesn't work. To cut a long drama very short, its peas or bust. No peas, no pudding. By then all of us have finished our meal. My husband has tried reasoning with him. My daughter has offered to eat them for him in return for two puddings and they are now elbowing each other. What happened to the nice family meal? I don't know how the Waltons did it. I don't remember them arguing over the kitchen table over peas. And there were five times as many children. In the end freddie's love of puddings persuades him to eat four peas. No more - no less. Four measly specks of green. And to cap it all as he places them in his mouth he retches. Then I feel sorry for him. You might be thinking does it matter if he eats them. Well no, of course not in the grand scheme of things, it matters zippo. But its the same WHATEVER vegetable I give him. We have dramas over peas, carrots, courgettes, broad beans, green beans, avocados, tomatoes, mushrooms, onions - everything but potatoes. Sweetcorn he will eat reluctantly. He picks everything off pizza, sieves soup, searches in casseroles to extract any trace of vegetable. Its not a pretty sight. If it really were just peas that made him retch of course he wouldn't have to try. But surely he can't ban every goddam vegetable on the planet. Now if any of you have any neat ideas with peas, send them my way. I'll try them out. And I promise not to retch. Here's one from Canada that may well make you retch. How about celery stick filled with peanut butter! I must admit I haven't tried it yet, but now I think about it, I must try it with my less adVEGurous 4 year old. She is British, but has spent most of her life here in Canada, so peanut butter rules! I've also tried courgettes cooked with olive oil and a tad of sugar. That doesn't go down particularly well though. Something to do with it being charred black. I'm not the best in the kitchen! 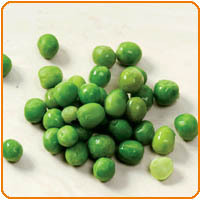 Talking of peas; frozen peas seem to be a hit as an occasional snack, possibly just because it's weird! I note that you like 'Lola and Charlie'. My girls love it, and like to play the game of making the vegetable that they find gross into something even more nasty. Mushrooms are mice in our family. Worringly my girls would much rather have one morsel of mouse, than a sliver of slimy mushroom! Other than that, it's a case of keep putting a token piece of veg. on the plate. One day, miraculously it will disappear and you won't find it on the floor. Well we can keep hoping anyway. I will try the courgette idea. He has a sweet tooth and I think if I can find a way of preventing it from burning, he may at least try it. Peanut butter I'm afraid he doesn't like. I love it but can't seem to spread my enthusiasm. Hi Charlotte. First reaction, but possibly the wrong one....take a deep breath... is: STOP! The vibes you are radiating are powerful and negative. Play the long game. Put no vegetables on his plate. Ever. Stop watching him and his non-veg eating. Control your paranoia. Meanwhile switch your energies on to something he can not share: enjoying your own veg with no ulterior motive. Celebrate those greens without a care. Treat yourselves to swede, mashed with butter and a little pepper. Savoy cabbage, steamed ( you do have a vegetable steamer, right? ). Brussels sprouts. mmmmm. Mange tout.Giant globe artichokes cooked whole. Dishes of melted butter. Pull off the sides one by one, dip in butter, eat the end bits. Finally remove the choke and eat the heart. Oh what a treat! Savour all those earthy, delicate flavours. Make soups. Follow the seasons. When spring comes, enjoy real purple sprouting broccoli ( not the fake stuff that's in the shops now). Join a weekly farm fresh veg delivery scheme and rise to the challenge. Forget Freddy's Fobia. And one day, like my wife, a meat only child, he MAY turn in to a veg only adult!!! Or he may not. his life. What's the worry?. OK. I can sense you struggling here. Not to say, squirming in your seat. OK OK OK, give in to it. Enjoy your veg trickery. play the game with a passion, like it's the most important thing in the world. Just don't say I didn't warn ya! So here goes. My top tips. 2. Investigate raw snacks like cucumber, carrot sticks dipped in salt, etc. Celery with stilton cheese? Cheese with apple? Apple crumble? I digress. 6. Get him interested in gardening. Start with cress, runner beans, baby tomatoes, etc. Make him the farmer and he may just get curious. Well good luck Charlotte, and remember - this mission sounds like a life's work! I will try these suggestions out over the next few weeks. The poor child won't know what has hit him - he will be completely bedazzled by my new-found culinary energy. Spooky. You just described my son but substitute peas for chicken. Right down to the retching. Re vegies, he loves them raw (even broccoli) and will rarely eat cooked vegies. Frozen peas are a huge hit - give them to him as a snack in a cup. Grow vegies yourself. Our son eats beans off the vine but rarely cooked off the plate. Go figure, 'eh? Carrot sticks are a good snack or try them grated first. Good luck! They must share some strange gene. I would grow vegetables myself but unfortunately we live in central London with a tiny stamp-sized patio. We have grown tomatoes and herbs but the opportunities for anything more are limited. Please keep reading the blog - and leave your thoughts. I thought my son was the only one who retched!!!! I have recently decided to coat his meager veggie portions with cheese, melted of course!!! I am sooo glad you started this site and that I found it today..
mother of Lucas aka"I hate Veggies" or "Do I have to eat all 3?" I was the same way when I was a kid. Heck, I still am. My parents tried making dessert contingent on finishing my vegetables, and now, at 28, I'm the only person I know who doesn't like desserts. Conditioned response? I hated vegetables (and fruits) for most of my youth. I bargained. I pleaded. I secretly tossed them out. When I couldn't avoid them, I literally gagged them down. I learned to eat the required vegetables first so that I could get the taste out of my mouth with the rest of the meal. I still do that with the ones I hate but have to eat because it would be rude not to eat them. But the list of vegetables I have to choke down has gotten, gradually, shorter and shorter. Spinach was the first to fall, then broccoli and cauliflower, then peas and onions and many more. Today I enjoyed asparagus for the first time, which is why I felt compelled to respond to this post. Someday I hope I'll like tomatoes, brussel sprouts, cooked carrots, and artichokes with however much butter. Not to mention mushrooms and practically every kind of fruit besides apples. But for now, I whole eat a lot of apples and a whole lot of broccoli, and I'm fine with that. I think you could try giving him all the space he needs and all the time it takes. If you eventually find a vegetable he likes to eat, keep it in stock. And show him how to prepare it. Show him how to prepare anything he likes to eat. Nothing has had a bigger impact on my picky diet than finding a brand new beefy recipe that I can't wait to cook, that just happens to feature, say, bell peppers (ech... wait.. suddenly not so bad actually). Reading the comments above only reinforced my belief that every single person has a unique taste. Some people like fresh crisp vegetables, some really like them canned and soggy. Some people like casseroles, some people won't eat foods that touch each other. Most people can't even tell you why they like something or not. Maybe he's like me, and finds the texture of vegetables more offensive than the taste. So you could try modulating the texture to see if there's one that works. Raw, toasted, battered and fried, doused in sauce, steamed, burnt, peeled, sliced, sliced another way, shoe-stringed, mashed. Are mashed potatoes acceptable? Visualize whirled peas, and blend them in. But you may have to just wait. Kids who hate vegetables sometimes do become adults who hate vegetables. But every adult I've ever met who hates vegetables wishes they didn't, and many of us find ways to balance our diets as best we can and make it work. I hated being forced to eat stodgy soggy icky peas when I was a kid. still n9ot a fan now though I can eat them.. part of the drabness that is the meat and 3 veg meal. I'll happily eat pretty much any vegetable if its cooked up in a nice Thai curry or tom yam soup though. Why are you trying to reason with him and giving in when he isn't doing what you say? Saying NO dessert unless ALL the peas are eaten should mean that if there are still peas on the plate then no dessert, period. If he knew that there would be no chance of getting pudding without eating the peas he would eat them with out a problem. However your son knows that you'll give in, so he mucks around until he gets his way. AND while he's mucking around he's the center of attention at dinner, why wouldn't he keep acting this way every time he gets a veggie on his plate? Yeesh, not eating your veggies or 'bargaining' at the dinner table sure weren't options when I was growing up. I ate what was given to me because I was hungry and that's what we were having. Even if I didn't like it I knew I sure couldn't fill up on pudding later so I ate it. Ultimately if you want him to eat veggies then put a lot more of them on his plate and a lot less of other things, and don't offer options like pudding! Hope I don't come across as a complete jerk, but sometimes a firm stance can go a long way. Besides if he's bargaining and acting like this over peas, what about when he's older and the stakes are higher? My kids have a veggie aversion. As an alternative, they drink Superfood juice. It's acceptable at this point. I will deal with it later if they are still refusing veggies at 25. I can't abide vegetables myself, and even as an adult, do some of the same things your son does in order to weed them out of his meals. I hate that about myself, but there it is. Some of us are just born to hate them. The good news is that, even if this veggie-hatred continues through childhood, he's likely to start eating at least some of them as he gets older. In the right dishes, I'll eat any number of vegetables... as long as they aren't too squishy. I understand that your son is a dessert-phile (I live in the US, no joke! ), but I find it too funny because you're bribing (Yes, that's the correct word.) your child. In reality, it's convincing him that veggies are villainous in palatability and desserts are the polar, positive opposite. If I were you, I'd offer him pudding with the peas, no kidding whatsoever - it may not make me laugh as much as your bribing moves go, but it's effective! I had a fond memory of eating peas with ditalini in grade (primary) school and I found it delicious! It was a lenient special-ed school (I'm autistic) and the counselors, teachers, and aides all bribed less on me because mostly the food was great!